Had a rough day at the Milwaukee Brewers Spring Training camp. None of the big names signed on the day I was there. I was able to get a few guys on 08 Topps cards so still ended up being a good day anyway. 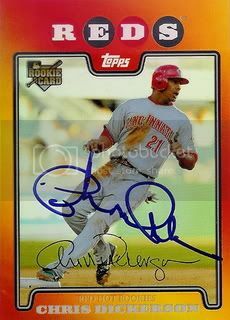 The best card I got signed was of former Cincinnati Reds outfielder, Chris Dickerson. He signed his Red Hot Rookies card for us. Very cool.